The second edition of the Vision-X VP Awards – a joint initiative between VisionPlus Arabia Magazine and the organisers of Vision-X Dubai, aimed at recognising the best products in the optical industry, was held in a grand ceremony on December 6, 2015, during the first day of the Vision-X trade show in Dubai. Introduced as a new concept last year, the awards received an overwhelming response in terms of participation from some of the leading brands in the optical industry across the globe, this year as well. The awards were hosted amidst a lot of excitement and fun that filled the evening as the winner’s league of the optical industry could be seen gleaming with pride. 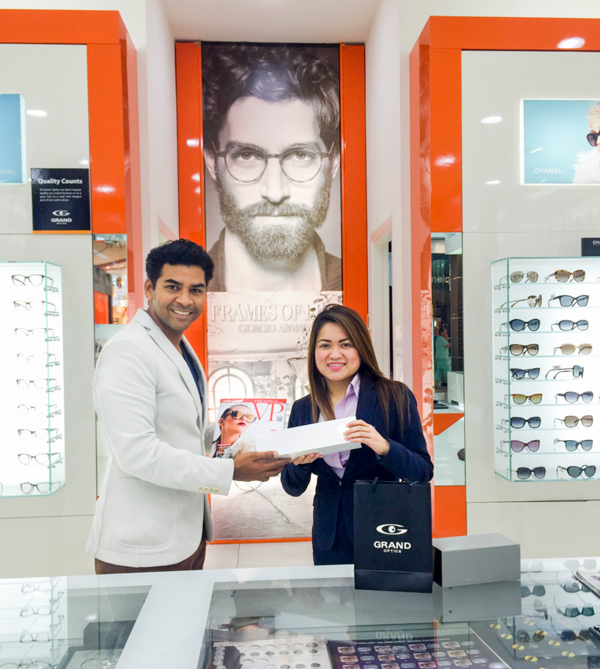 Among the thousands those who voted, Ms. ​Anne Murray Alfonso, from Grand Optics, LLC, Dubai Mall won an Apple Watch in the VXVP Apple Watch lucky draw. She was handed this prize by Mr. Jasbir Bolar, Marketing Director of VisionPlus Magazine.